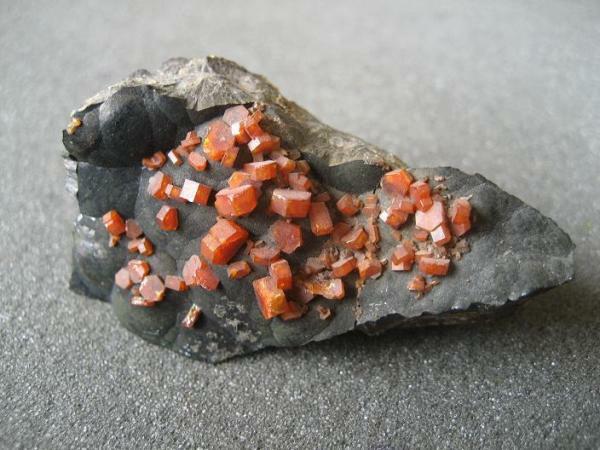 The first specimen is a Vanadinite on Goethite Matrix from Taouz, Morocco. This material from Morokko is quite common, but i like this piece very much because there is a great contrast between the glassy, orange crystals and the black matrix. Overall size: 55 x 33 x 24 mm. 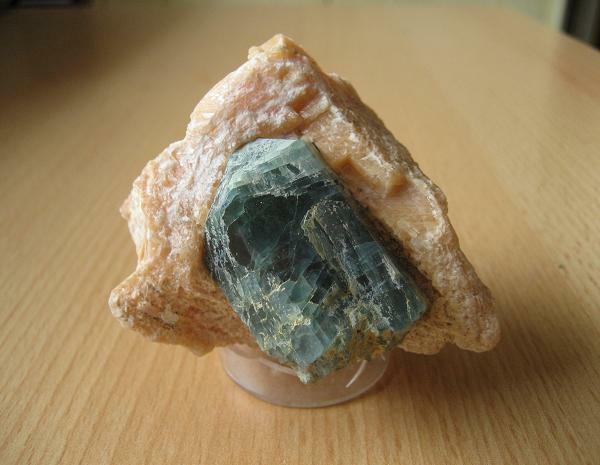 This one is a nice German classic, i purchased it fom an old collection: Fluorite from the Clara Mine in Black Forest. Overall size: 100 x 65 x 70 mm, the largest crystal egde has a lenght of 20 mm. 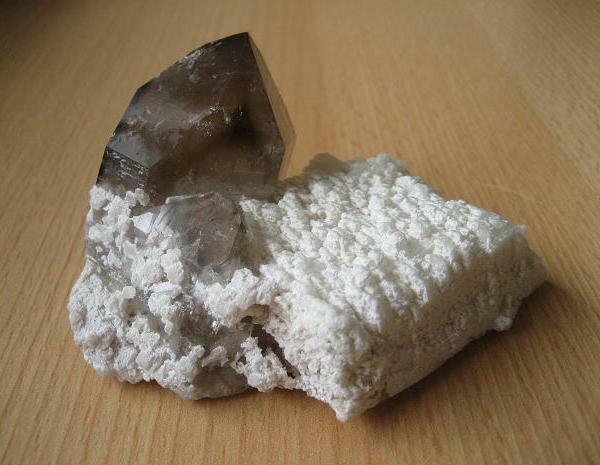 Calcite from Juchem quarry near Idar-Oberstein, Hunsrück. Overall size: 115 x 55 x 53 mm, crystals about 40 - 50 mm. 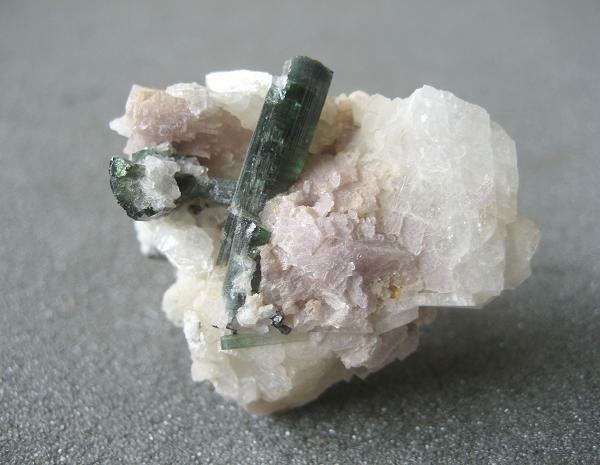 A 7 mm single crystal of green Fluorite on Feldspar, from the Erongo Mountains in Namibia. Overall size: 65 x 55 x 40 mm. 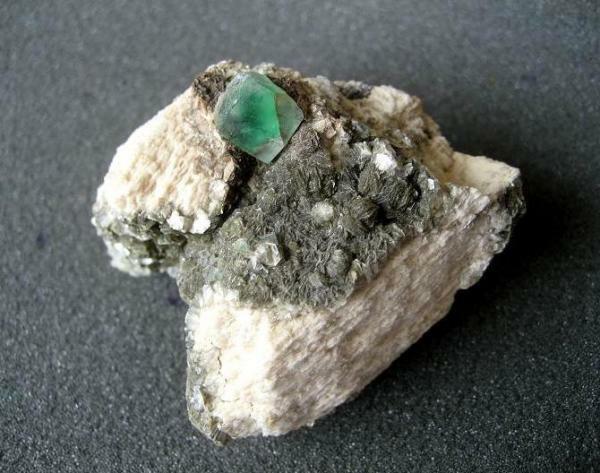 Elbaite from the Pederneira Mine in Minas Gerais, Brazil. The largest crystal has a lenght of 18 mm. Overall size: 40 x 30 x 15 mm. 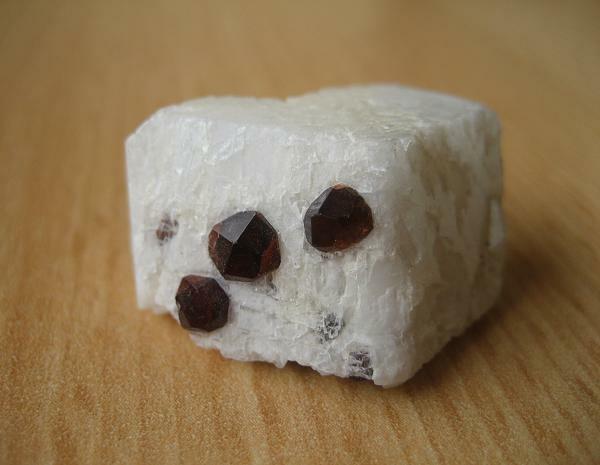 Another European classic: Garnet, var. 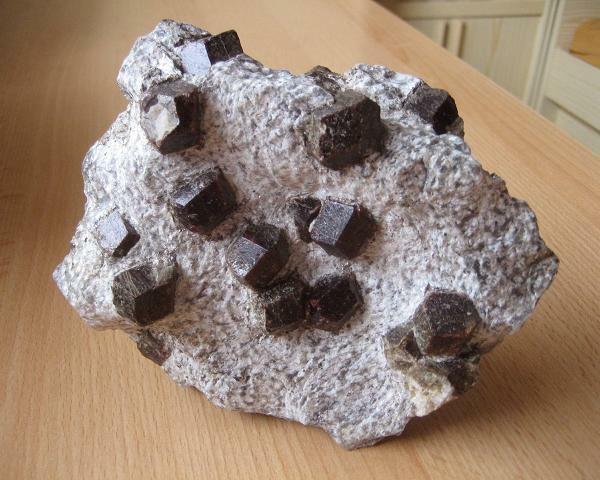 Almandine from Ziller Valley in Austria. This large plate has an overall size of 155 x 120 x 60 mm, the largest crystals are about 20 mm. 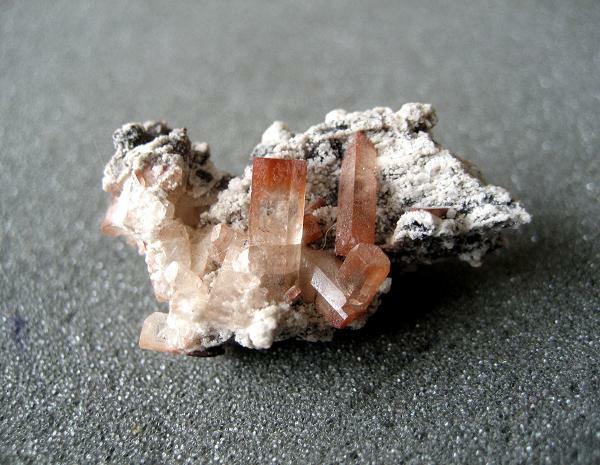 The next Garnet is a little bit smaller ;-) Spessartine in Albite from Shigar Valley in Pakistan. Overall size: 27 x 12 x 20 mm, crystals are 3, 4 and 5 mm. 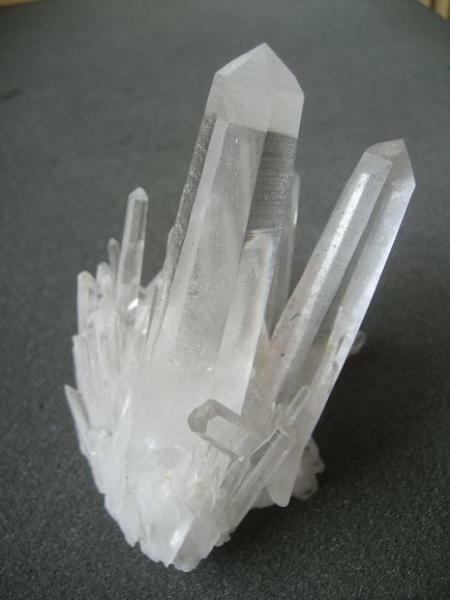 The last for today: A crystal clear and extremely sharp cluster of quartz from Jinkouhe, Sichuan province, China. Overall size: 90 x 70 x 75 mm. Nice rocks Tobias. Welcome to the fraternity. Or loonie bin, depending on your point of view. 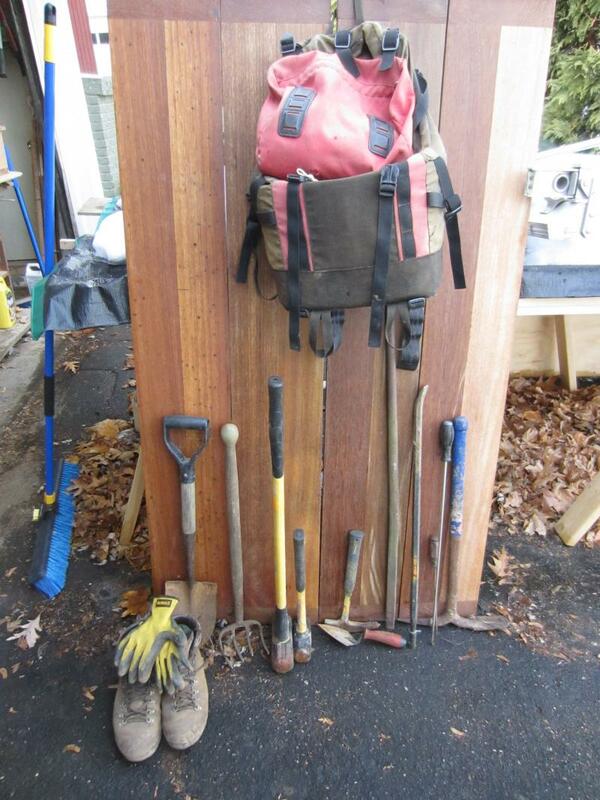 Your specimens are nice, they have a fairly uniform size, so they go together well. They look nice as a group. Keep up the postings, and pictures. We all like pictures. Me, I like fluorites, am always excited to see a fluorite specimen from a new locality, so your mention of having fluorites from little-known German (or other European) locations holds much promise. We all look forward to seeing more of your stuff. Big mistake!. I just noticed that I wrote Coronadite and in fact is Hollandite as we stated in this other post: https://www.mineral-forum.com/message-board/viewtopic.php?t=57. I already corrected it in my upper text. Ed wants to see German Fluorite, here is one from a classic locality: Halsbrücke Mine near Freiberg (Erzgebirge, Saxony). Size: 75 x 45 x 40 mm, longest edge 25 mm. I'm sorry for the photo quality, this specimen is better in person; the crystals are absolutely shiny and nearly lustrous. 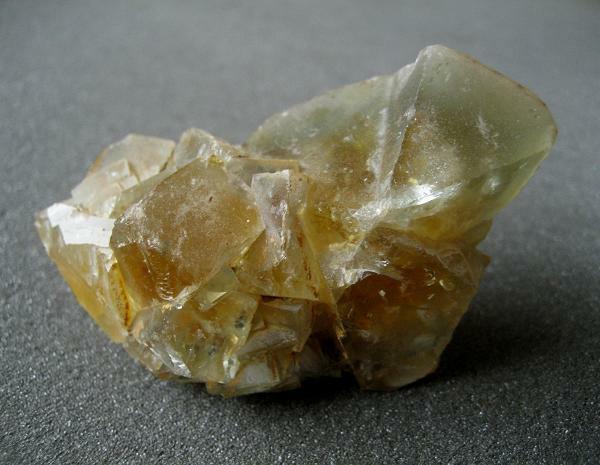 I love this bi-coloured specimens from Freiberg, the crystals are like honey inside and pale green on the edge. I didn't mean lustrous, but transparent - sorry. 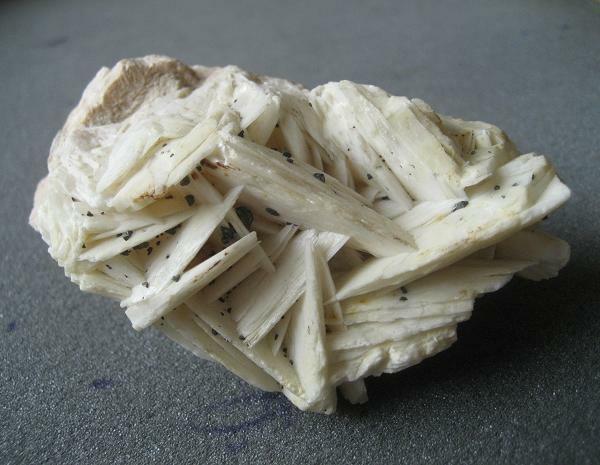 Here is another German classic: Baryte/Baryte (choose the spelling you prefer ;-)) from Dreislar (Sauerland, North-Rhine-Westphalia). Covered with small Chalcopyrite crystals, overall size: 95 x 55 x 50 mm. 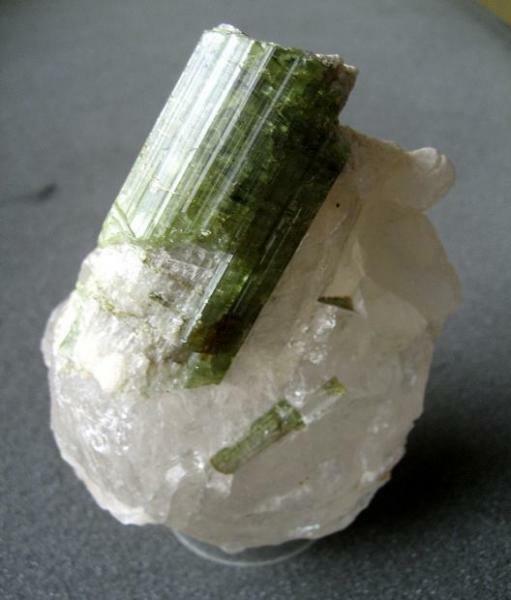 This is an Elbaite Tourmaline from the Urubu Mine in Minas Gerais, Brazil. 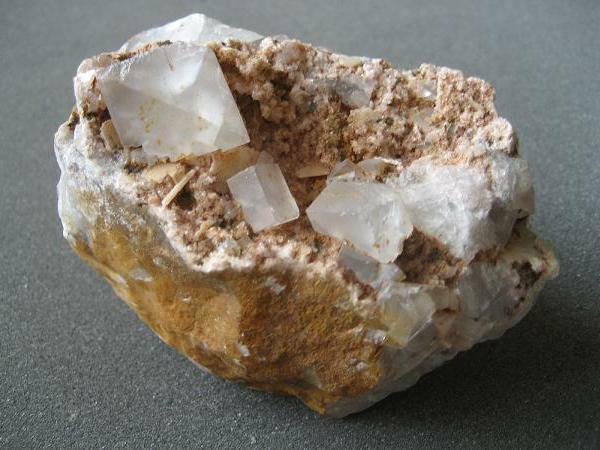 The crystal is hollow and has a core which is filled with Quartz. Even if the Tourmaline is broken and hollow, the piece is quite nice and impressive because of the contrast between the crystal and the white Quartz matrix. 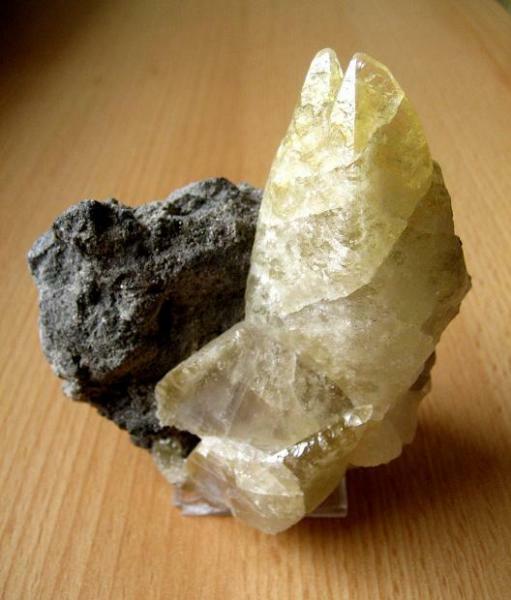 The large crystal has a lenght of 65 mm, overall size of the specimen: 95 x 70 x 60 mm. 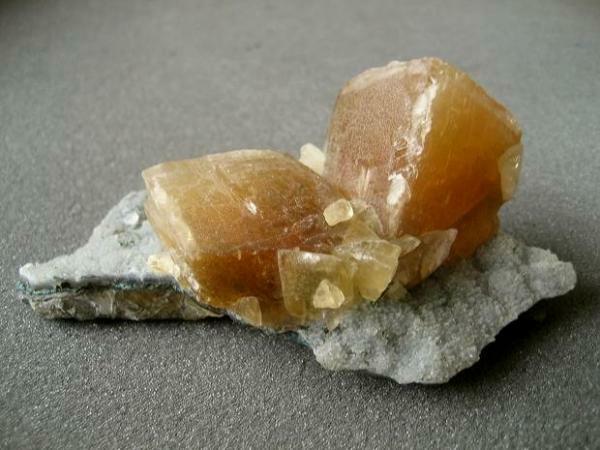 Here's a U.S. classic which i like very much: Calcite from the Sweetwater Mine in Missouri. The large crystal has a lenght of 90 mm, overall size is 95 x 90 x 50 mm. The next one is an Apatite in orange Calcite Matrix from Sludyanka (Baikal Lake area, Russia). Crystal size 40 x 25 x 25 mm, overall size 70 x 60 x 50 mm. Our museum here in Marburg has such a matrix specimen of Apatite from Sludyanka - the largest crystal (good quality for this location and with very intense colour!) 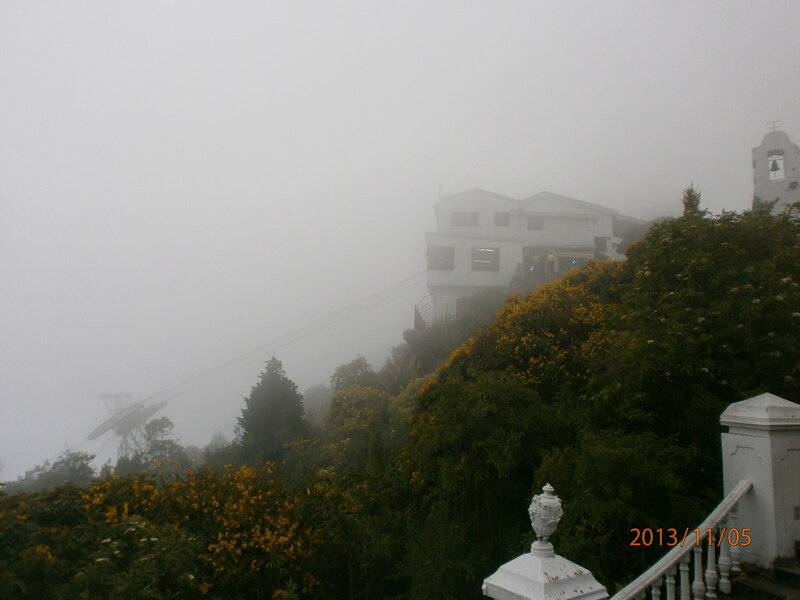 is about 150 mm in lenght. Simply incredible! Here we have a Smoky Quartz on Cleavelandite from Galilea, Minas Gerais. The collector ho sold it told me that this finds are quite new. I don't know if this is correct ...? The large crystal atop measures 55 x 35 x 30 mm, overall size of the specimen is 100 x 70 x 45 mm. A small but very beautiful Topaz specimen from Villa Garcia, Mexico. 10 mm crystal, overall size 33 x 22 x 17 mm.